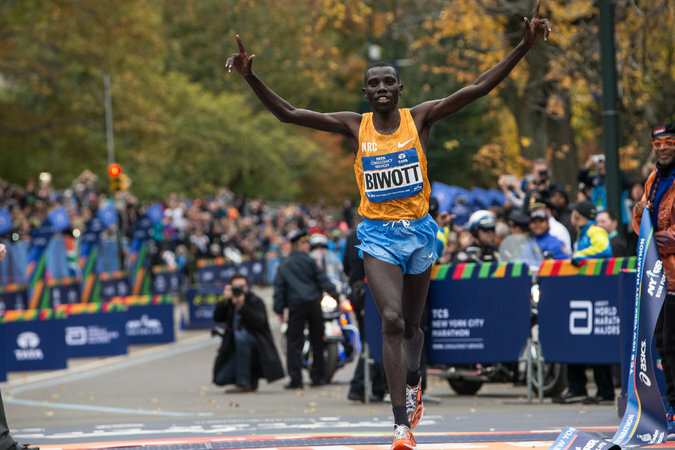 Stanley Biwott won the 2015 New York marathon in impressive fashion, beating a strong field that included two time Boston marathon winner, Lelisa Desisa, former world record holder Wilson Kipsang and world half marathon champion Geoffrey Kamworor. Biwott won by leaving his surge to the very end. Desisa made his surge at the halfway mark.and whittled the leading pack to eight. Geoffrey Kamworor surged to the front at the 20 mile mark and clocking a 4:24 mile. The surge broke Kipsang and Desisa, leaving only Kamworor and Biwott. However Kamworor soon fell back after having expended his energy on the surge. Biwott ended up winning in 2:10.34. Biwott becomes the fourth successive Kenyan winner after Geoffrey Mutai who won twice and Wilson Kipsang who won in 2014. Mary Keitany’s win was impressive by the sheer distance by which she beat the field. She produced an incredible turn of speed over the last 5 miles to win in 2:24.25. She finished a good 1:07 minutes ahead of second placed Aselefech Mergia. At the 20 mile mark, the leading pack had four runners: Priscah Jeptoo, the 2013 winner, along with the Ethiopian duo of Tigist Tufa and Mergia,. That was when Keitany produced a burst of speed that broke the leading pack. Keitany became the first woman to successfully defend her title at the New York City Marathon since Paula Radcliffe in 2008, and afterwards, the 33-year-old said much of her performance can be credited to previous race experience. This entry was posted in Kenya Athletics News, Kenya Sports news and commentary and tagged mary keitany, stanley biwott. Bookmark the permalink. Request: After serving/living in Kenya for 20+ years, in my heart it is my home! Although now I live in the US I do return to visit friends who are more than family every year. This year I am bringing with me my pastor, his wife and their 4 teen daughters. They are all runners!! The first daughter is a top runner in our state at age 17!! I thought it would be soooo cool to have them meet one or more of the STARS of Kenya! Any possibility of this happening?? We will be in Kenya February 24 – March 6—-soon! Eager for your reply. Kenya is ALWAYS first in my world!! !